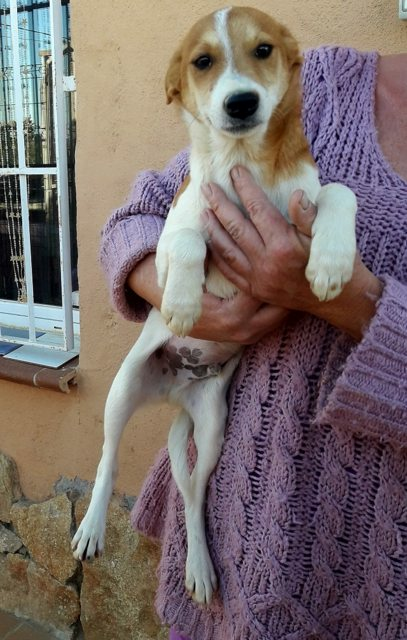 Antonio is a 5 month old male Cross-Breed. Handsome little tan and white young lad with a silky short coat, he is getting to know us all well now and is happy in his foster home having lived “rough” for the first 4 months of his little life. Angelo weighs 6.5 kilos (Mum weighed 10kg) and he stands at – 32cm (will grow a little more). He’s chilled and loves playing with the other little mates. Poor puppies were born to a stray on a local part finished housing estate in Spain they were fed by the residents who contacted the local rescue PAWS for help. There were 5 puppies in total rescued, plus mother also – now she is spayed and rehomed. We can test with cats if required. Fosterer’s report: Of the 5 pups, Antonio is the smaller male. Antonio turned into a very social playful happy little man. Good with both people and the pack and he’s the bravest of the three. Would make a great family pet. They all seem to have mums lovely easy going nature. At first, like his brothers and sisters not used to human contact as they lived in a olive grove until they were 4 months old. But we’re working on it and they are very happy though to see me when I’m entering their kennel and get excited when they see me approaching. All the pups are good with other animals, no experience with cats, although they would have mixed with the street cats whilst on the urbanisation. Happy healthy puppies that we are working on lead training and house training at the moment. No food guarding observed. 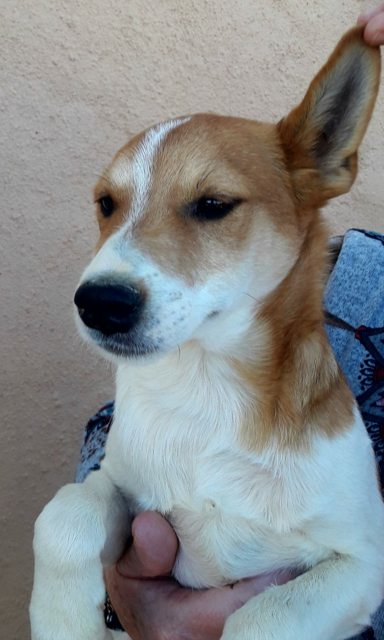 Current location is in a foster home in Spain can travel to the UK once he has a home to go to. Vaccinated, wormed, flea treated, Too young to be neutered but this must be done when they are old enough, microchipped, Pet Passport, FREE 4 weeks Pet Insurance, Any known health issues NONE KNOWN. 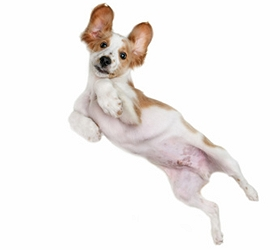 For Dogs coming from Spain and Portugal: This adoption fee is a contribution towards the costs of rescuing the dog- microchip, passport, vaccines, tests for S European diseases, neutering, parasite treatment and transport to the UK. We can not home dogs from Spain or Portugal to people who work, even part time. They need someone at home all day, they are not used to being alone, so even a couple of hours broken with a dog walker will be too much for them to cope with. They are highly likely to develop separation anxiety which is distressing for them and everyone in their new home.